Again, I'm mainly asking about physical resemblance, with plot being secondary. Does Captain Tracey resemble any particular famous American (pre-1969)? Also secondary: the conscious intent of the filmmakers. As a longtime fan, I don't remember anything particularly interesting, in interviews, regarding "The Omega Glory" (Gene Roddenberry is the credited writer). Note: I haven't yet read These Are the Voyages by Cushman, which seems to be an important reference. I realize the two characters pictured resemble each other, to some degree, but there seems enough difference to ask the question. Also, Tracey doesn't seem Washington-like: whereas Garth strikes patrician poses, Tracey is more gritty and intense. He also retains his skills, with his fall-from-grace being solely due to choices. 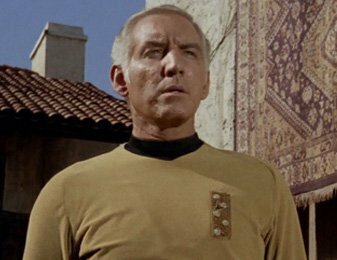 Director McEveety said "Morgan Woodward was the one I used mostly [in various shows], because he was such an interesting character, I thought. He gave such dimension to a character. He could play crazy and he could play very nice. And, by saying dimension, I'm saying you could get elements of both at the same time. Good and bad. Real." 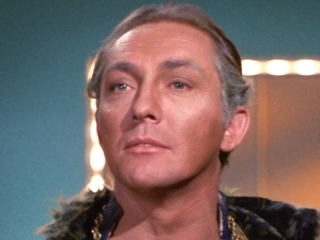 Woodward had previously appeared on Star Trek as Simon Van Gelder in "Dagger of the Mind", which was also directed by McEveety. The two men knew each other from Gunsmoke. By the time the western left the air in 1975, Woodward held the record for the most guest appearances on the screen, with 19. Not the answer you're looking for? Browse other questions tagged star-trek star-trek-tos inspiration or ask your own question. How does Captain Picard “know” that Armus is immortal?